eraclea Skin Care Renews Social Content, Display and Remarketing Contracts With ASTRALCOM | ASTRALCOM - Content Strategy, Conversion Marketing and Customer Acquisition. After success across multiple channels and platforms, eraclea Skin Care has renewed their agreements with ASTRALCOM to continue to provide services in display and social content marketing. 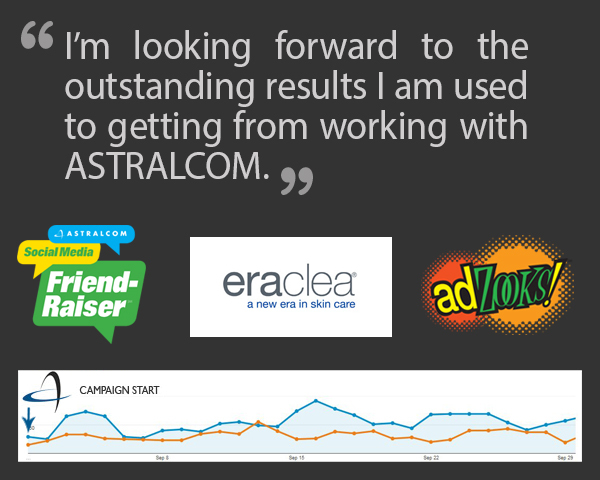 ASTRALCOM has been providing eraclea Skin Care with brand awareness and targeted customer acquisition via display and social content tactics that include geotargeted ads, Facebook advertising and content curation and Instagram content and contests. “Working with eraclea on lifting their brand awareness has been great,” commented Richard Bergér, VP E-Business at ASTRALCOM. “eraclea has a unique style and brand essence that we’re effectively communicating to people,” added Mr. Bergér in reference to the Instagram work that ASTRALCOM is doing for eraclea. Need some brand lift? Got a unique product, service or brand essence that you need to communicate to a specific audience? Call us at 800.536.6637, or click and let’s talk about your unique attributes.